The total solar eclipse of August 21, 2017 is fast approaching. This event, the first coast-to-coast solar eclipse across the continental U.S. since 1918, will take place in a narrow band from Oregon to South Carolina. More than 300 million people live within a day's drive of the path of totality, and perhaps 30 million will travel to see the eclipse. To help you see this event for yourself, and to make sure you get the most out of the experience, Agena AstroProducts assembled this helpful checklist to make sure you know what to plan for and expect before, during, and after the eclipse. ☐ With your telescope or binoculars and solar filter, or with your solar glasses, note the earliest time at which you notice the beginning of the eclipse. NOTE: This is the only time you can safely look at the eclipse, and you can only see the total eclipse if you are on the path of narrow path of totality at the right time. Once Baily's Beads or the Diamond Ring disappear and the Moon covers the Sun, it is safe to remove your eclipse glasses. ☐ As the Moon begins its exit from the Sun's bright face, watch for the return Baily's Beads or Diamond Ring Effect. NOTE: At this point, you MUST put your eclipse glasses back on and cover your camera, telescope, or binoculars with their solar filters. ☐ Start planning for the next one! 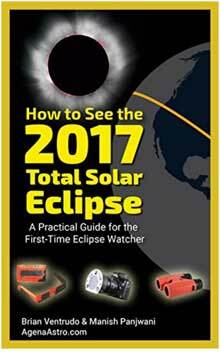 Learn more about observing the August 2017 total solar eclipse with the AgenaAstroProducts guide How to See the 2017 Total Solar Eclipse: A Practical Guide for the First-Time Eclipse Watcher.This concise and practical guide shows you everything you need to know to be in the right place at the right time---and with the right tools---to see this amazing astronomical event. You'll discover the best places to observe it across its long and narrow path. And you'll find out how to choose and use inexpensive solar eclipse glasses, solar filters,maps, and other basic tools to help you safely see this astounding and memorable event. Article and photos © Agena AstroProducts, 2017. Reproduction without permission prohibited. Great article, Brian. I plan on being on the Cherokee reservation in NC for the eclipse. Where will YOU be?